A metal roof is a metal roof, right? WRONG. 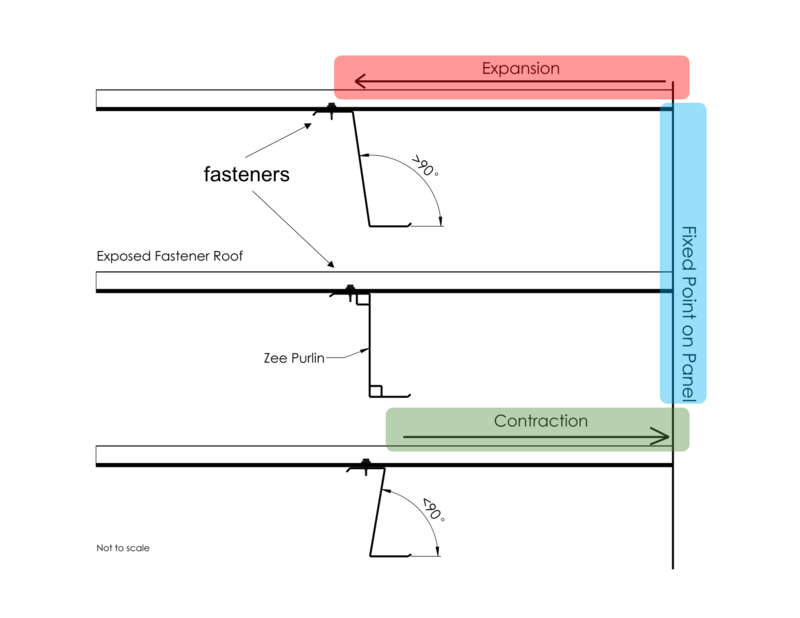 Standing seam and exposed fastener roofs may both be metal and may even serve similar purposes, but the two styles are very different indeed. 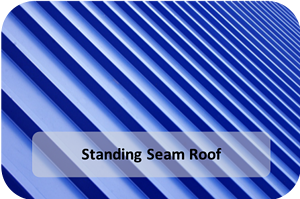 Let’s start with the standing seam roof, or SSR as it is commonly abbreviated. The profile of this roof has flat panels intersected with evenly spaced vertical legs or seams. Fastenings are concealed on these panels – hence the reason the profile is commonly called “concealed fastener”. SSRs can be attached to roof decks via clips or with a fastening flange. 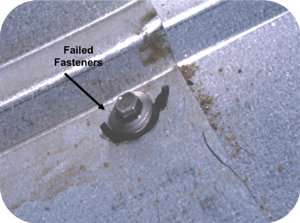 Fasteners are driven through clips into the roof deck but do not pierce the metal panels. The clip and the fasteners are then hidden within the standing seam. Thus, the panel is attached to the clips and loked together – either by snap-fit seam geometry or mechanically-folded during installation. SSRs come in a multitude of shapes and sizes, single-folded, double-folded, T-Shaped, Bulb-Shaped, and each either snap-together or are mechanically-seamed. The industry consensus favors sta nding seam, for its higher quality, ability to respond to “thermal cycling” and aesthetic design. While material and finish warranties are generally the same, most standing seam systems are offered with better warranties on the entire system. Some manufacturers also offer extended assurance that the roof won’t leak (weather-tightness warranty) over some given period of time. The absence of exposed fastening and concealed clip attachment lends itself to a much lower possibility of leakage as compared to the exposed fastener system which can require hundreds or even thousands of fasteners and rubber grommets that are subject to installation error and fatigue in service because they penetrate the weathering surface, and “pin” the panel to the structure. Of course, to toot our own horn, another way to preserve your SSR roof warranty is to utilize S-5!’s zero-penetration attachment solution technology. 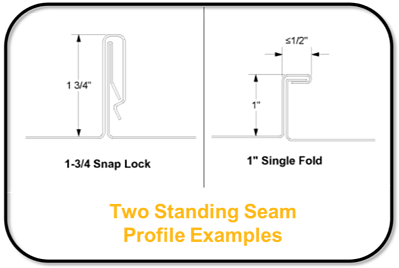 Our clamps can attach almost anything to your standing seam roof – all without piercing the metal and without violating the roof’s warranty. Rooftop mounting is a breeze when you do it The Right Way™. The most obvious difference between standing seam and exposed fastener is the lack of visible fasteners. Beyond the aesthetic benefits, exposed screws are a greater potential source of installation goofs. Under or over-tensioned screws, and stripped screws aggravate the obvious – which is that holes in the roof can leak if not properly executed. Direct attachment by screw fastening also does not provide for thermal relief when panels grow and shrink with hot and cold. Standing seam avoids these pitfalls with concealed fastening that also enables thermal response without fatiguing the attachment. Generally speaking, metal roofs last much longer than other roofing types. Metal’s durability and responsiveness make it a smart choice for both commercial and residential buildings. But standing seam roof profiles typically require less frequent maintenance - at least in terms of checking for loose or corroded fasteners. “Maintenance” is usually a matter of routine inspection for small problems before they become big ones. Removal of pine straw or deciduous leaf debris is no less critical and should be done at least every couple of years - regardless of profile type. Metal panels need to be able to expand and contract. This is called thermal movement or thermal cycling. When a metal panel heats up from the sun, it expands – increasing in length. Then it contracts when it gets cold, reverting back to its original dimensions. This is thermal movement (see graphic below). In addition, this process is directly related to panel length. It will also accumulate and multiply across panel sections that are joined end-to-end with mechanical fasteners. You now have two or more panels - that think they are one – all adjusting to temperature changes. Luckily, thermal movement does not occur across panel widths. This is because panel rib or seam geometry enables enough flexure to mitigate thermal movement, so it does not accumulate. 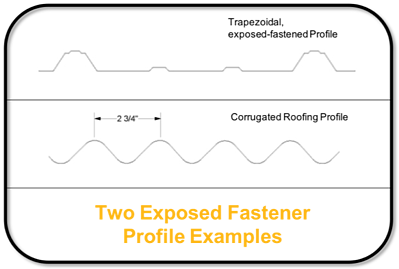 Standing seam roofs are never double-pinned to the building, so their expansion and contraction abilities are increased. SSRs are very modification-friendly. Choose desired paint color, and select Galvalume, other steel substrates, copper, zinc and aluminum depending on design preferences. 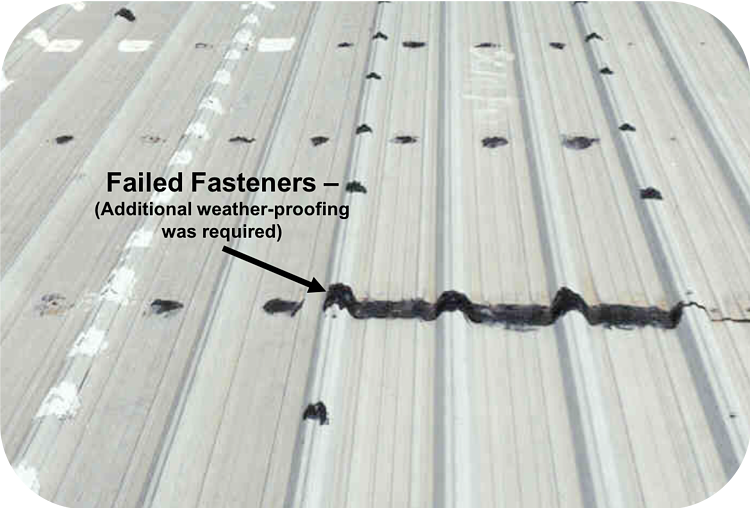 Exposed Fastener roofs involve driving fasteners through the panels and directly into the roof deck. The edges of the panels overlap, and fasteners are screwed through both layers. The fasteners remain visible. 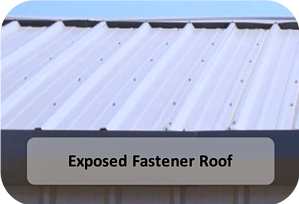 Exposed fastener roofs are less expensive than standing seam systems. Lower cost comes from the fact that these roofs are manufactured with thinner gauge and wider-dimensioned panels, reducing material handling aspects of installation. This generally means that less roofing material is needed overall and thinner panels typically cost less. Additionally, EF roofs don’t use clips which also reduces costs (i.e. fewer components, and cheaper to install so overall total cost of roof is less). With EF roofs, you don’t have to hand or mechanically-seam the panels together. Having the panels overlap and fastening them together at the same time means a reduction in overall labor. Will it Weather the Weather? Exposed Fastener roofs do still offer substantial protection against harsh weather elements. But it is important to note that industry standards for standing seam versus exposed fastener are not necessarily equal. So, for example, wind uplift testing may or may not have been performed on EF roof profiles. Also, don’t expect weather-tight warranties to be included. Holes are required to secure roof attachment to the deck - a process that is more prone to installation error. It’s not called an exposed fastener roof for nothing. As mentioned above, SSRs require more finesse during installation. Many common exposed fastener roof panels are sold at big box stores and many are even DIY project-ready for those weekend warriors. As much as aesthetics are touted with standing seam roofs, the lack of hidden fasteners on roofs is still appealing to many for practical reasons. If cost, ease of installation, and the need to match it to surrounding buildings are aspects you are weighing in your decision, then EF might be a good choice. It is always advisable to perform routine maintenance on any roof (metal or other). And SSRs generally don’t require as much maintenance as do EF roofs. (In either event, one should still remove debris, clean gutters, remove stains, scan for scratches, and check for trouble-spots for potential corrosion). That being said, EF roofs do come with an additional upkeep checklist (e.g. checking fasteners for damage, checking panel lapping locations, checking for water infiltration, etc.). Standing seam and exposed fastener are distinctly different concepts for metal roofing. We’ve compared them above, but ultimately the roofs serve different purposes depending on location, weather, design, and more. Aesthetically-speaking and weather-wise, standing seam offers secure zero-panel-penetration as well as a long-lasting roofing solution. It protects some of the most prestigious buildings in the world. If cost is a big one for you, and you are also considering installing it yourself, exposed fastener may be a smart choice. Regardless of the profile, S-5! has a clamp or bracket solution to fit your needs. From snow retention, to solar panels, walkways, HVAC, communication equipment, fall protection, and more, your current mounting conundrum will soon be of the past. Not sure what the best solution is? Check out this informative blog on finding The Right Way™. And/or, find more assistance from our Technical Support. ...to Metal Roof Innovations Central to get the latest from S-5! straight to your inbox!